Or so they say. After reading this youll see that one union has became a safe haven for evil personified. 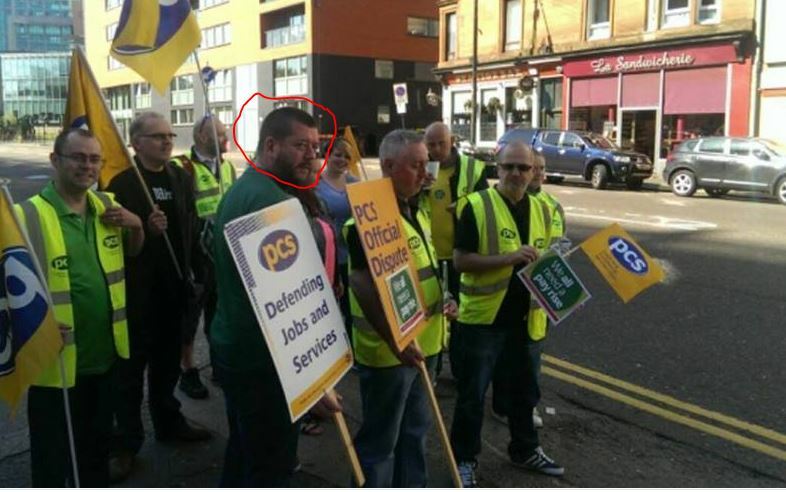 Mairtin Gardner also known as Mairtin Delaney has been working at the Glasgow head office of the DWP in the Northgate building and is the PCS branch organiser. Some of our readers may recognise the name Mairtin Gardner. Last year eight fans of terrorist fc were arrested for wearing t-shirts in support of proscribed group INLA . T shirts which also made reference to the republicans hatred of the remembrance poppy. A 49 year old Mairtin Gardner from Pollok was one of those arrested. You would expect the DWP to hammer any employee for such conduct of bringing the Department into disrepute with that one act. Well the DWP has been allowing Gardner to perpetrate his hate over a number of years without any sort of discipline or action. 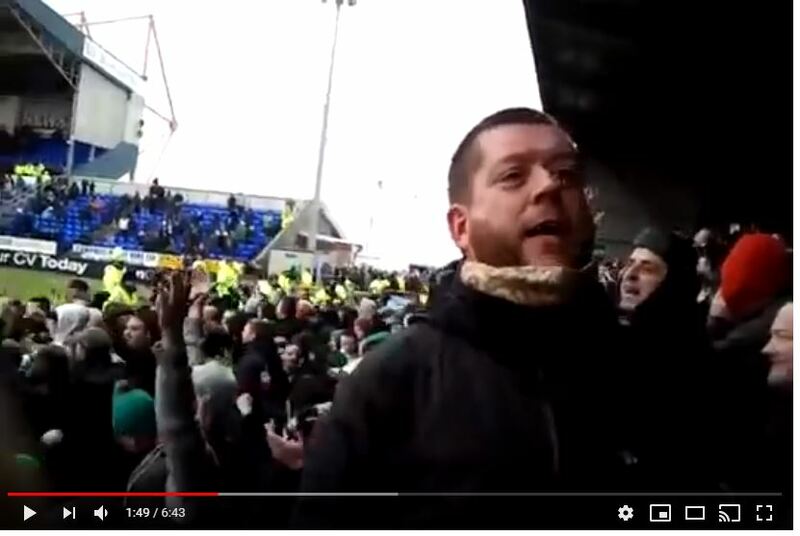 We have him on video a number of years ago leading chants of "The huns are going bust" at a football match with other sectarian bigots. With his lamb chop sideburns he is easily picked out and over the years pops up in photos with the terrorist loving green brigade. Last Saturday the STUC organised an anti racism march in Glasgow. The anti Protestant group Call it out took part just in front of a group from the British hating Cairde na hÉireann from the slop house Gallowgate. Into the limelight came Gardner to help carry the Call it out banner. 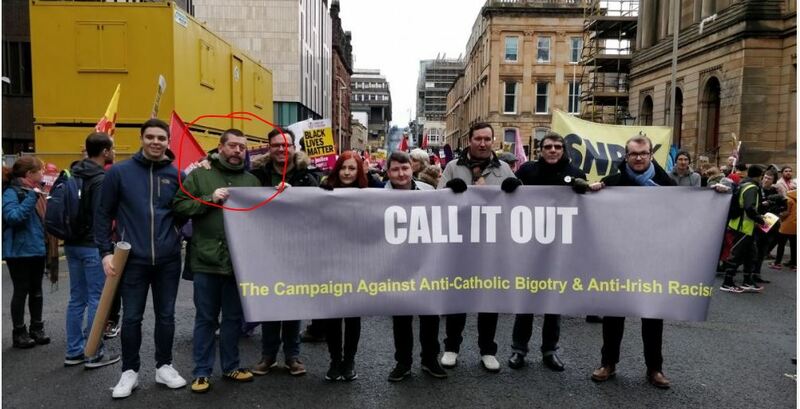 An organisation that is meant to stop anti catholic and anti Irish bigotry has a sectarian bigot at the front with other Protestant haters Angela Haggerty and Paul Quigley. The DWP must act and rid itself of Mairtin Gardner. We dont expect the PCS to do anything as it has became no more than a breeding ground for SECTARIAN bigots.